Hard bands inside of a muscle, often caused by stress or strain, can cause either direct pain within the affected muscle, or indirect pain somewhere other than the affected muscle. This is known as myofascial pain. This condition can generally only be diagnosed when a health professional feels the tough bands of muscle during a massage or assessment. The main difficulty physicians have in diagnosing this condition is differentiating it from another chronic pain disease called fibromyalgia. The two pain conditions aren’t interchangeable, but they can feel similar, especially if myofascial problems continue to occur over a long period of time. In general, the diagnosis must be confirmed by feeling for “trigger points,” and by the success of the treatment itself. Electromedicine is a broad category of relatively new technology that can be used to “release” trigger points. The most common technology used is known as a TENS unit. A TENS unit is non-invasive and works by sending pulses along the skin, and stimulating the nerve strands. The pulses disrupt the message of pain from making its way to the brain, cause the body to release endorphins (the body’s natural painkiller), and can sometimes allow the release of tight muscles. TENS units are a popular choice due to their relatively high level of success in trial and in practice. Physical therapists are also known to use ultrasonic waves to reduce pain, but their level of success remains unconfirmed. Another electromedicine technique, which shows some promise, is that of low laser therapy. 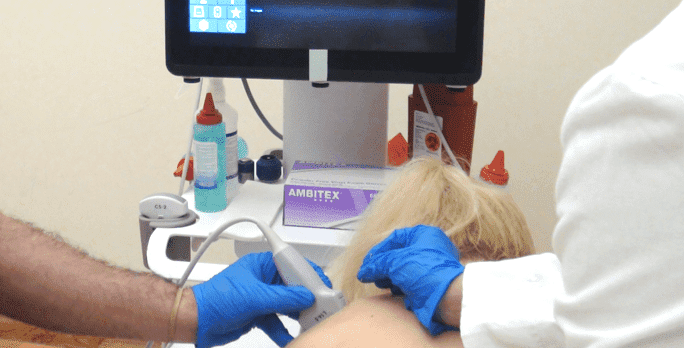 This method essentially means exposing the soft tissue to a specific wavelength. It is also known as cold laser therapy. Massage therapy is the practice of manually manipulating muscles and soft tissues, and has been around for thousands of years. It is commonly used for myofascial relief in part because of its general success, and also because of its relative accessibility and cost effectiveness. Massage therapy isn’t limited to one technique; in fact there are countless methods from around the world. When dealing with trigger points, it is important to note that some forms may be more successful than others. Physical therapy uses mechanical force and movements to promote mobility, strength, and function. It’s use in treating myofascial disorders stems from a simple concept; if the body is strong, its musculature evenly balanced, then it won’t need to overcompensate. This overcompensation is often the cause of trigger points. Both studies and practice show that physical therapy is most successful when used in conjunction with massage therapy to alleviate muscle pain. Some people suffering from muscular pain turn to alternative therapies. They may be used as a stand alone treatment, but are generally considered complimentary to other therapies. Methods included in this category are music therapy, acupuncture, vibratory stimuli, and mindfulness training. All of these methods appear to cause improvement in the sufferers of pain. Many experts attribute this to the placebo effect and disregard alternative therapies, but others feel that they are invaluable in pain management. Another little explored tactic that is rapidly gaining popularity is biofeedback. Biofeedback is similar to mindfulness training, but has the added benefit of allowing the subject to experience and control the results visually. An example would be using a fire on a monitor to represent a subject’s pain, and encouraging that subject to make that fire smaller. These types of experiments have met with some degree of success. The effects of myofascial pain can be devastating, especially if it becomes chronic. Luckily more treatments are available to combat it than there have ever been.